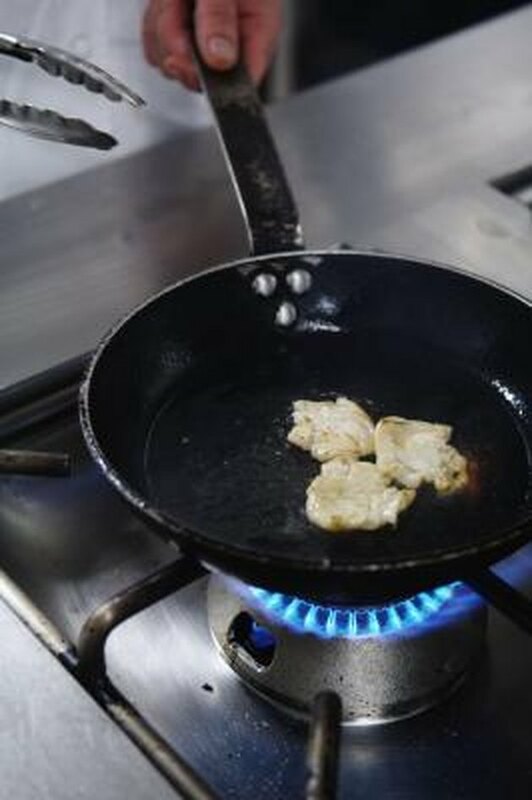 When you have a stove that is not a flat top, foods can spill down into the stove burners while cooking. The foods continue to burn each time you turn on the stove burner, so it is best to figure out a routine to make the clean-up process easier. A long-term solution to this problem is to line the stove-top burners with aluminum foil. When you do this, you are able to simply tear off the foil when food spills and place fresh aluminum foil back onto the burner. Line your stove burners with aluminum foil to make spills easier to clean up. Pull off a sheet of tin foil about 4 inches wider than the stove burner. Lift the grate off the stove burner, and position the aluminum foil over the stove burner. Push it down so the foil fits snugly into the stove burner. Pull it back out and cut a hole in the middle of the aluminum foil so the middle of the burner stays open. Place the aluminum foil back into the stove burner, and trim any excess off around the top of the stove burner. Repeat on all of the stove burners, and replace the aluminum foil when needed.